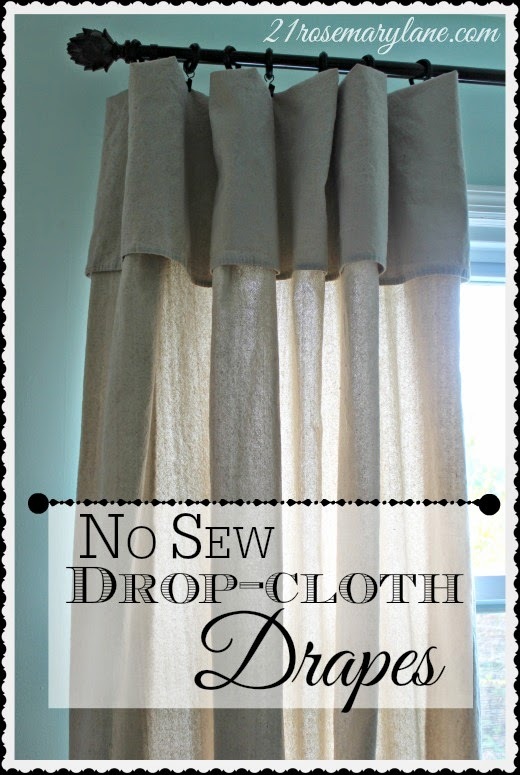 21 Rosemary Lane: No Sew Drop-Cloth Drapes ~ They Really do Work! Ok ok so I have seen it done numerous times, read about how to do it on a bunch of blogs and researched the heck out of the internet, and nothing could stop me from giving this idea a whirl! And can I tell you...it is sooooooo sooooooo E A S Y and C H E A P! 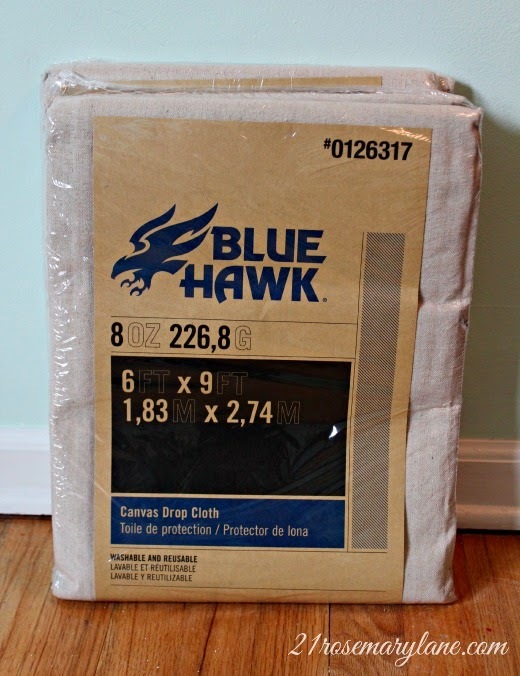 I chose a 6 X 9 canvas drop-cloth I purchased at Lowes for about $10. The first thing I did was to wash these suckers to soften them up because they are pretty dang stiff coming out of the packaging. I read that if you really want them to soften a lot, run them through the washer 2 or 3 times and use lots of fabric softener. I washed mine once with softener and then ironed them so they have a little bit of a wrinkled texture but I really don't mind. 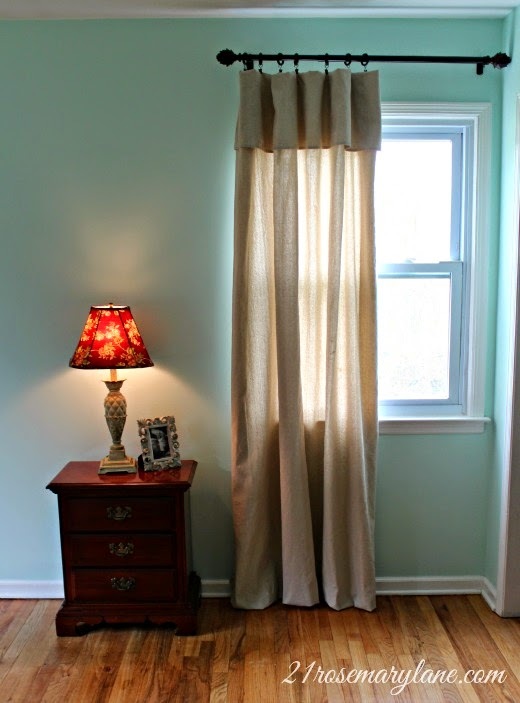 The drop-cloth was a little tall for my room so in order to make them fit, and not having to take the scissors to them, I simply folded them at the top and created the look of a valance. 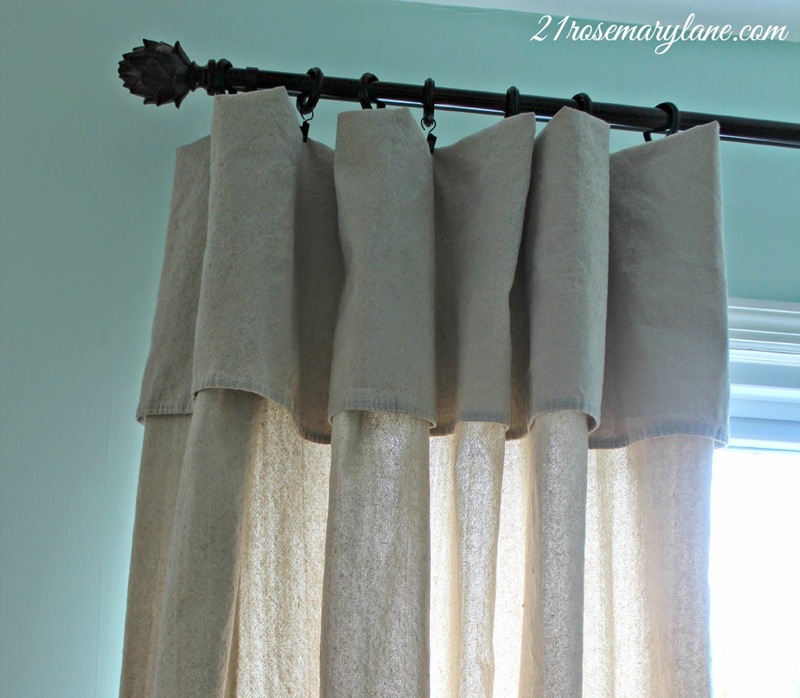 Using curtain rings I purchased at Walmart, I eyeballed where to clip them on. They were still a wee bit long for my window, so using what I already had around the house I hemmed them with some double stick tape. Next time I am at Walmart I will have to remember to purchase hemming tape. I put up my rod and hung my drape. It couldn't be easier! 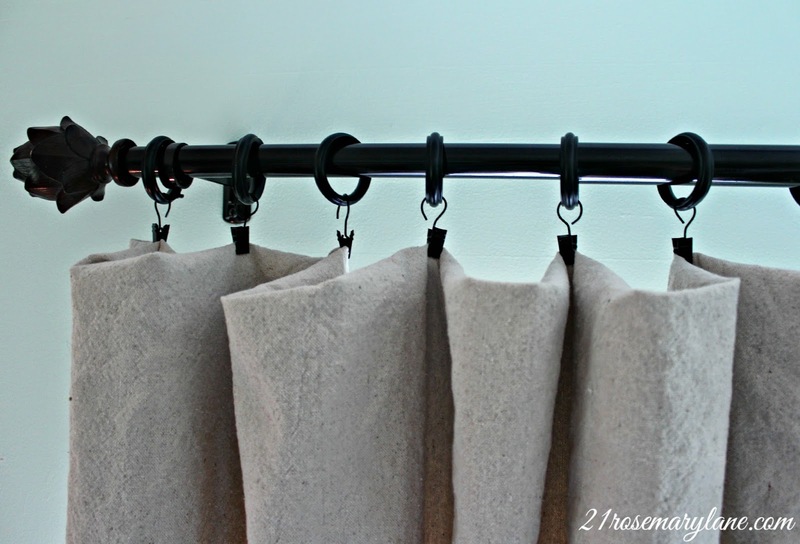 Now I have also read that it is suggested to hang these drop-cloths high and wide. As you can see they are hung higher than the window, but I couldn't go wide because of the closet wall on the right. I probably could have gone almost to the ceiling but I am secretly hoping that my hunky hubby, Mr. Rosemary Lane, will some day put crown molding in this room too! 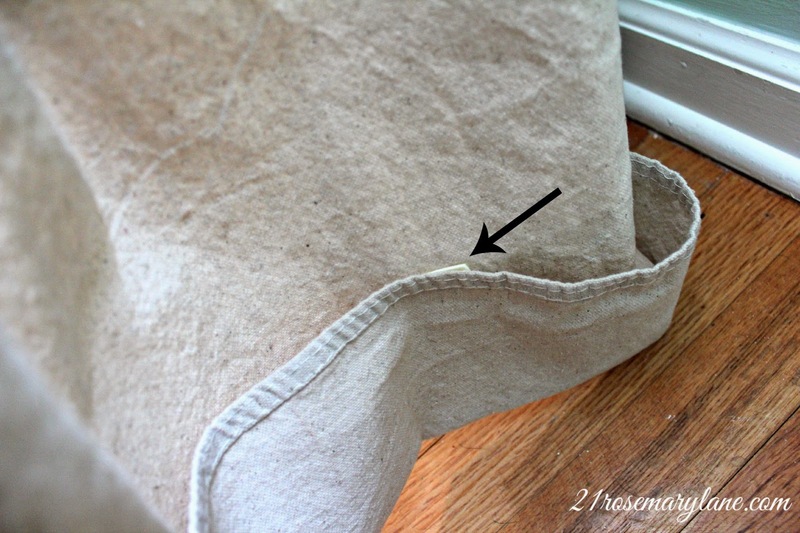 The canvas material is a nice weight so they seem much more substantial that some of the flimsy curtains you could buy for a few dollars more. I also love the neutral color and the texture of the canvas. My favorite part of this whole project was the reaction I got from the salesclerk at Lowes. He asked me if I was going to cover something with them and I politely replied "No they are my new bedroom drapes." Then he gave me a puzzled look like he didn't hear me correctly and so I reworded my reply. He smiled and nodded and then walked away scratching his head. Anyhow, this weekend is going to be a busy one with communions and Mother's Day so there won't be much time to forge ahead with the guest bedroom makeover. I still have to paint the inside of the closet and MR. RL needs to purchase and hang new closet doors. Wishing all you moms out there a wonderful Mother's day and a very happy weekend to everyone! These look fab! I've never seen this before, but I love it! They look fabulous and they really are so easy. I bleached a pair and they came out a really nice oatmeal color, just what I was looking for. Have a wonderful Mothers Day. Barbara these turned out great and the fold really looks like a valance!!! The look wonderful I'm going to send this to my friend she's looking for bedroom curtains, she paid $200.00 for curtains and is sending them back because she did n't care for them. Maybe she will try this. Yours looks great and really nice job! Such a pretty design i really love it its amazing good.